We’ve seen both the Magic Bar and the Magic Charger from Mobee before, which will wirelessly charge up your power-draining Apple wireless keyboard and mouse, respectively, but now the company has created a smart charger that can charge up to three devices at once and still seamlessly blends in with your sleek Apple desktop. The Magic Feet ($150) as it is called, combines the forces of the Magic Bar and Magic charger into one powerful Apple-centric addition to your desktop set up. Mobee has done a good job adopting the sleek Apple aesthetic, so other than the added bulk, the Magic Feet should fit right in with your set up without ruining the appealing minimalism. The device is an inductive charger that will eliminate having to replace physical batteries in your mouse or keyboard all the time, which as we know, can get annoying. 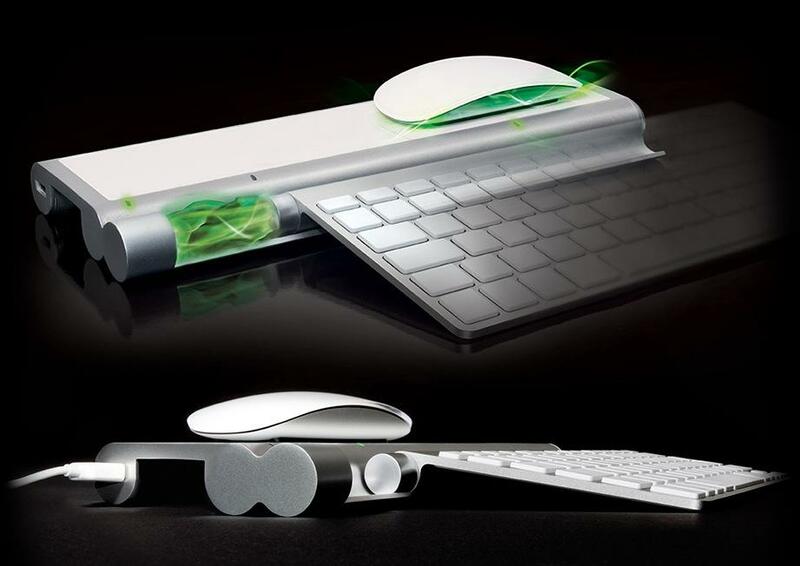 The charging station comes with a battery pack for your mouse as well as a small battery that will easily slide onto either a wireless keyboard or a magic trackpad. Once you’ve installed the battery packs to your devices, all you have to do is place each device onto the appropriate charging spot on the Magic Feet and your mouse or keyboard will be fully charged in a matter of hours. Set your mouse on top of the device while you sleep and it will be charged and ready to go in the morning. What’s even better is that the Magic Feet also adds four new USB ports to your Apple set up. The Mobee Magic Feet is powered by an AC adapter and will be available starting March 1.